President Dilma Rousseff of Brazil has denounced a "coup" plot against her, suggesting that Vice-President Michel Temer is one of the "conspirators". The president - who is facing impeachment in the national Congress - hinted that he was one of the ringleaders of a plot to overthrow her. She said an audio message released on Monday by Mr Temer, whom she did not name, was evidence of the conspiracy. In the message, Mr Temer appears to accept replacing her as president. He also calls for a government of national unity. Correspondents say that it implied that Ms Rousseff's impeachment had already happened. Mr Temer says the message was released by accident - his office said it was sent to aides erroneously. In it he appears to be rehearsing an inaugural speech. The tape was run by Brazilian media hours before an important vote by a congressional committee to decide whether impeachment proceedings against President Rousseff should continue. "Many people sought me out so that I would give at least preliminary remarks to the Brazilian nation, which I am doing with modesty, caution and moderation," he says on the recording. The BBC's Wyre Davies in Brazil says that, given the fact that Mr Temer may also face impeachment proceedings, his words appear somewhat premature. The public war between President Rousseff and her once trusted vice-president is an indication of how bitter Brazil's political crisis has become. Dilma Rousseff once referred to Michel Temer as "meu querido Michel" (My dear Michel). Today, without directly naming Mr Temer, she accused him of being the leader of a conspiracy. As leader of the large, centre-right PMDB party, Mr Temer's support was a crucial factor in keeping Brazil's coalition government afloat. As the economic and political crisis deepened, the decision to withdraw from that coalition increased the likelihood of President Rousseff's impeachment. Ms Rousseff and her allies have repeatedly accused opposition members of Congress, who are themselves accused of far more serious crimes than she is, of orchestrating a "coup" against her democratically elected government. 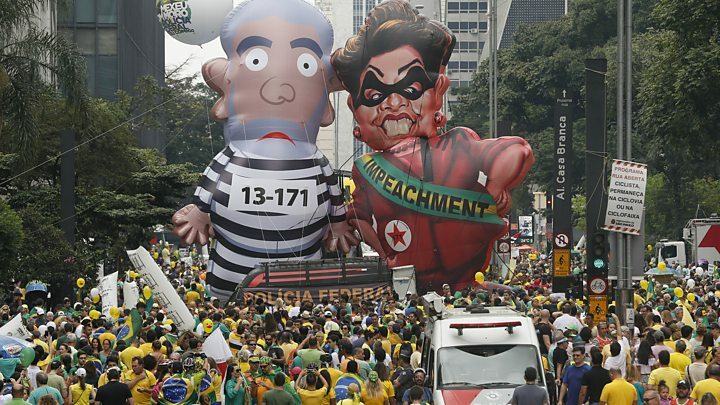 But in truth, with a flailing economy and a wide-ranging corruption scandal, this impeachment process has never really been about the relatively minor fiscal misdemeanours on which Ms Rousseff faces impeachment. After 12 years of leftist Workers' Party rule, her opponents see this as the best way of removing an unpopular president. The 65-member congressional committee voted 38 to 27 to recommend going ahead with impeachment proceedings. All eyes will now be on a full vote in the lower house starting on Sunday in the capital Brasilia. Security will be stepped up around the Congress building, with thousands of police deployed in the area, local media report. "They now are conspiring openly, in the light of day, to destabilise a legitimately elected president," Ms Rousseff said. In an apparent reference to Vice-President Temer and lower house speaker Eduardo Cunha she referred to "the chief and... the vice-chief" of the plot. The president said that one was guilty of "unimaginable abuses" in the impeachment process while the other was "rubbing his hands in glee while carrying out a farcical leak of an inaugural speech". President Rousseff said she was shocked by the audacity of the leaked recording. "One of the chief conspirators assumes the condition of president of the republic," she said. She said the audio "reveals a betrayal of me and of democracy" and showed that Mr Temer had "arrogance and contempt for the people". Speaking later in an interview with the conservative Estado de Sao Paulo newspaper, Mr Temer denied he was leading a coup and argued that he had spent weeks away from Brasilia specifically so that no-one could accuse him of plotting behind the scenes. President Rousseff faces impeachment over allegations that she massaged deficit figures ahead of her election campaign two years ago - accusations she denies. While her opponents say the impeachment is supported by most Brazilians, the president's supporters have labelled it a flagrant power grab by her political enemies. If the president and Mr Temer are both suspended from office, the next in line to assume the presidency is Mr Cunha. Mr Temer was until recently a close ally of Ms Rousseff but his party has formally withdrawn from government as is now supporting calls for the president's impeachment, our correspondent says. Lower house vote: An impeachment vote is expected in the lower house on either Sunday or Monday. A two-thirds majority is required for it to go forward to the Senate. Latest surveys suggest the number in favour is short of the total needed to carry the motion.